Flowing through the rapidly developing Bitterroot Valley of Southwest Montana, the Bitterroot River is known as an excellent rainbow trout stream. This article examines the river, the fishing and the floating in-depth. The Bitterroot River in Montana is a medium sized stream that begins with the confluence of the East Fork Bitterroot and the West Fork Bitterroot near Connor, Montana. It then flows North through the scenic Bitterroot Valley on its way to the confluence with the Clark Fork near Missoula, Montana. The Bitterroot River flows through beautiful scenery. The Sapphire Mountains rise to the east while the Bitterroot Mountains lay to the west. The Bitterroot Valley itself is lush by Montana standards—it’s the “banana belt” of Montana. While it does get cold during the winter in the Bitterroot Valley, true frigid days, like eastern and central Montana experience, are the exception and not the rule. 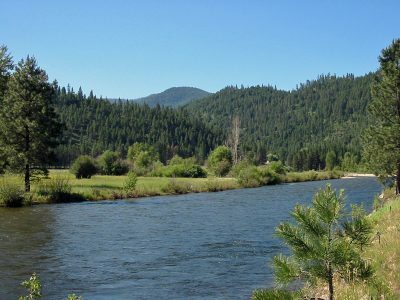 Unlike many of the rivers located in Montana that flow through isolated and remote country, the Bitterroot Valley is well-developed and also compromises the fastest growing region of Montana. As a result, services and other amenities are easy to find. The Bitterroot River has moderate fly fishing pressure in relation to other Montana rivers. During the early season, fly fishing pressure can be heavy, but tapers off as the summer wears on. The river has moderate flows in its upper stretches with slower stretches downstream from Florence. 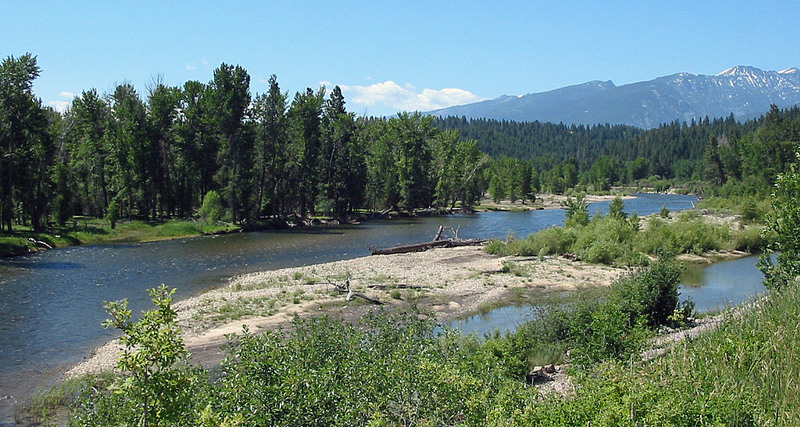 The banks of the Bitterroot River are a mix of woodland and grass, as the valley is a prime agricultural area in Montana. The Bitterroot River is quickly gaining its reputations as one of the premiere trout rivers in the western part of Montana. Flowing through the scenic Bitterroot Valley, the Bitterroot River seemingly has it all. Runs, riffles, pools, flats, gravel bars and numerous braids and channels combine to create a river of remarkable diversity. Fishing pressure ranges from high during specific hatches to low-moderate during the fall—which is somewhat surprising considering the significant growth seen in the Bitterroot Valley. The two forks which create the Bitterroot River also offer their own quality fly fishing—and in a rather remote setting. The primary fishing in the Bitterroot is for rainbow trout. Brown trout are found in the upper part of the river in decent numbers, although they are not of the monstrous size found in other Montana rivers. Cutthroat trout, many of decent size, are also found extensively in the upper portion of the river, especially upstream from Hamilton. The fly fishing on the Bitterroot River generally kicks into high gear in the spring, during the Skwala stonefly hatch. Larger brown trout are regularly taken during this hatch on the upper poart of the river, although they must be released, as the fishing during this time is catch and release only. The Skwala hatch generally begins in early March and can last all the way through the end of April. Anglers who visit the Bitterroot River during this hatch should be prepared for variable weather. Spring in Montana can bring warmth and sun or snowstorms—sometimes all on the same day. The water temperature during spring is very cold—often just a few degrees above freezing. Floaters should arrive with neoprene gloves and booties to prevent their extremities from freezing solid. Anyone who plans to wade fish the Bitterroot River during the spring should bring warm, insulated waders. Using a thin wader designed for warm weather use will quickly freeze any angler down to the bone. The best fly fishing during the spring Skwala hatch occurs during the afternoon, particularly on days that are warm and sunny. Popular flies for this hatch include the Olive Stimulator and Skwala Stone, in sizes 6-8. For anglers unfamiliar with Skwala stoneflies, it is worth noting that Skwala hatches are different than the Salmon fly hatches that occur on the Bitterroot River and other nearby rivers. The hatches of Skwala stoneflies tend to be spotty and are usually localized on the same parts of the river from season to season. In short, don’t expect the Skwala hatch to resemble a Salmon fly hatch, with massive quantities of bugs emerging from the river while the hatch neatly and predictably makes its way up/down the river. When searching for likely fly fishing spots during the Skwala hatch, concentrate efforts on locating gravel bars that have smooth water—which are commonly found throughout the length of the Bitterroot River. Beginning usually in early May, the Bitterroot River usually gets blown-out by spring run-off, although it can occur earlier during warmer weather or later during cold springs. Since the Bitterroot drains some sizable mountain ranges that receive ample snow, spring run-off usually turns the river into a fast moving, muddy mass of water. Fly fishing during the height of spring run-off is difficult if not impossible. The Bitterroot River generally begins to clear by late May or early June. As the river clears and recedes, the entire length of the river becomes a wonderful place for fly fishing with standard small dry fly patterns, such as the Elk Hair Caddis, Parachute Adams and the Pale Morning Dun. Sizes of these flies should range from 8-14. By the end of June, even during cold springs following heavy snowfall years, the Bitterroot River is generally clear and still has decent flows since intense irrigation hasn’t started yet. It’s perfect timing, too, since one of the prime hatches on the Bitterroot occurs during this time—the Green Drake and Brown Drake hatch. This hatch typically lasts into the middle of July. The best time to fly fish during this hatch is during the afternoon, especially on overcast days. Popular fly patterns for this hatch include the March Brown, Quigley Cripple and the Green Drake Wulff. A number of local fly patterns, tied by local fly-fishing shops, are also very popular and change from year to year. It is recommended that any angler who will be venturing out to the Bitterroot River during this hatch stop by one of the many fly shops to pick up some of the new patterns that have been created specifically for this hatch. As the Bitterroot River is in Montana and flows through a broad, open, agricultural valley (although the agrarian nature is fast changing due to the explosive growth in and around Missoula), it is no surprise that grasshopper imitations work well beginning in July and lasting through early September. Hopper fishing works well on the entire length of the Bitterroot during middle to late summer. Hoppers are generally best fished right along the shoreline, focusing on undercut banks and natural obstructions such as downed trees. However, it never hurts to occasionally throw a hopper right out into the middle of the river, as the larger trout will come to the surface for the large meal a hopper provides. Most Hopper patterns work equally well for the Bitterroot River, and should vary in sizes between 2-8. During the middle of the summer, besides using hopper imitations, anglers can also fly fish on top using small attractor dry fly patterns, such as the Madame X, the Renegade and the various Humpy imitations. During the middle of summer, fishing is best during the morning and evening hours—since this is when most hatches occur and because the water is cooler. The best dry fly fishing in the middle of the summer is found on the upper portion of the Bitterroot River, between Hannon Memorial FAS and Wallace Crawford FAS. Some of the best, and most difficult, fly fishing on the Bitterroot River happens during September and October during the large Trico hatches. Fishing during this hatch is demanding since the flies are tiny, the leaders long and light, and presentations is key. Accurate casts to rising trout and drag free floats are a primary requirement for fishing success during this time. For the angler who is comfortable fly fishing under these circumstances, some very large rainbow trout and an occasional large brown trout await. When fishing during this hatch, don’t ignore the many braids and channels of the Bitterroot River, especially those found around Darby and again further downstream near Missoula. Popular fly imitations for this hatch include the Parachute Adams, Sparkle Dun and the Parachute Trico, in very small sizes ranging from 18-22. Ideal fishing raft for 1-2 anglers. Very tough, portable and easy to setup. 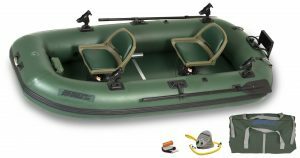 More info about inflatable fishing rafts. 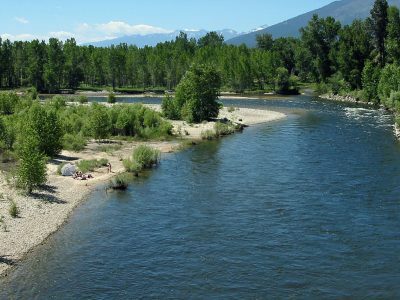 The Bitterroot River begins just upstream from Hannon Memorial Fishing Access Site and downstream from the small town of Connor, Montana. This is an excellent stretch of water for both wade fishing, as the river is of only moderate size, as well as floating, as no diversion dams or other obstructions are found along this section of the Bitterroot River. The fish in this segment of the Bitterroot River tend to run a little smaller than is found elsewhere on the river. However, what it lacks in fish size it makes up for in a wonderful fishing environment. Good populations of cutthroat trout, rainbow trout and brown trout are all found in this segment. Since this segment lies the furthest away from Missoula, it receives less fishing and floating pressure than is found further downstream. As a result, the fly fishing isn’t quite as demanding and the trout are more a little more easily caught. Combine that with the wonderful scenery and you have a recipe for a great day on the water. This section of the Bitterroot River is for anglers who like to fly fish in riffles, since riffles are long and plentiful in this segment. Since this segment is not prone to the de-watering that occurs further downstream, it fishes well into the summer, helped by the cooler flows coming down from Painted Rocks Reservoir. Small standard dry flies, fished in the riffles, work well into the middle of the summer when other sections of the Bitterroot River tend to go into hibernation due to warm water and low flows. Overall, if you arrive on the Bitterroot River later in the summer or during a low water year, consider fly fishing this section. While the potential to catch a real large rainbow is somewhat less than found further downstream, the better river flows and cooler water temperatures increase the likelihood of a successful fishing outing. Wading boots are quite helpful to avoid broken legs and ankles when fly fishing. 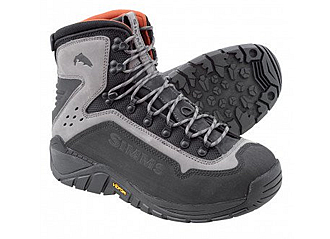 Read this guide for information on how to select the right type of boot for your needs. 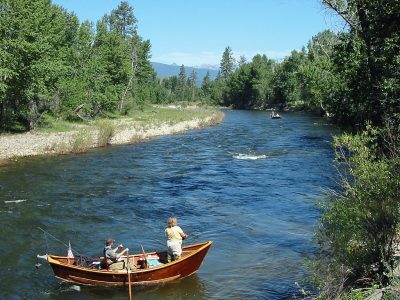 This section of the Bitterroot River, which runs between the towns of Hamilton and Victor, offers intriguing fishing, especially right after spring run-off in June and early July, as well as later in the fall. During the middle of the summer, the combination of low water from heavy irrigation use and high water temperatures due to slow river flows tend to put a lid on some of the fly fishing. The pressure on this stretch of the river is also generally lower than is found further downstream. What’s intriguing about this section of the Bitterroot River are the numerous braids and channels. All these braids and channels provide a wonderful place for the wade angler—since most rafts tends to stay in the main channel. During the summer, the river is easy to wade. The slower flows and lower water levels remove most of the hazards. All of the gravel bars also make for easy wading and shore walking. Although the fishing access sites are fairly widely spaced in this section, any wade angler seeking solitude usually just needs to make the easy walk up or down the river from a fishing access site to one of these side channels to have an enjoyable fishing experience. The fish in this section generally are somewhat larger than is found further upstream. However, just be prepared for lower fish numbers per mile than elsewhere on the river. Successful fly fishing on this stretch requires finding the scattered good places to fish, such as in the holes, undercut banks, the riffles and around downed timber. When floating this stretch of the Bitterroot, be prepared for some portages. A number of diversion dams are found on this section of the river, along with other irrigation hardware. This section of the river runs between the towns of Victor and Florence. The numbers of rainbow trout found in this stretch of the river rebound, due to higher flows and better habitat. Wade fishing also becomes more difficult, due to the wider width of the river and its increased depth. This stretch of the Bitterroot River lacks the braids, channels and gravel bars that are found elsewhere on the river. Instead, lots of flats, deep holes and some intriguing undercut banks provide the main fly fishing action. The section of the river can receive heavy use during the summer, particularly on warm, weekend days. 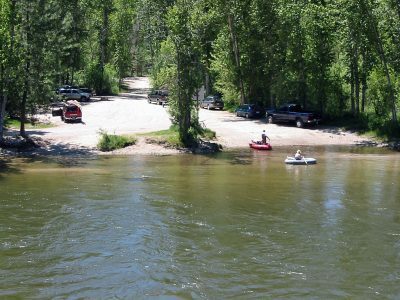 The Bitterroot River is very popular for recreation floating since the river flows are steady if at times somewhat slow. There are also no diversion dams or other obstructions to hinder floating or that requires a portage. Combined that with the rivers close proximity to Missoula and its suburbs and you end up with many people floating down the river in a wide variety of boats, inflatable rafts and float tubes. The best time to fish this stretch of the Bitterroot is during the spring, early summer and fall. During summer, especially during low water years, this section of the Bitterroot River can get quite warm—which hampers quality trout fishing. Inflatable boats are superb platforms for fishing Montana rivers. 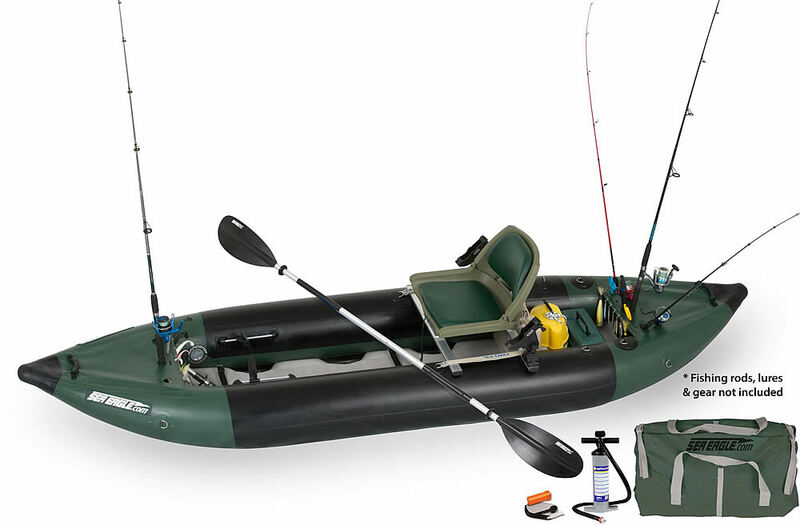 This comprehensive guide helps anglers choose the right inflatable fishing boat for their specific needs. This section of the Bitterroot River is also heavily used for recreational floating, but should not be overlooked by visiting anglers. While trout populations are lower than found upstream, the rainbow trout in this segment can get quite large. This segment of the Bitterroot River also has many braids, channels, sloughs and gravel bars. The best trout fishing on this segment of the Bitterroot occurs during the spring, early summer and again in the fall. During the middle of the summer, the water temperatures often get too warm to spur productive trout fishing. But don’t despair if you arrive on this segment of the river during either low water years or later in the summer. While the warm waters might have put a temporary lid on the trout fishing, the warmer waters are also home to bass and northern pike. When fly fishing for the bass, crayfish and streamers work very well although some heavier gear is required to heft these large flies around. 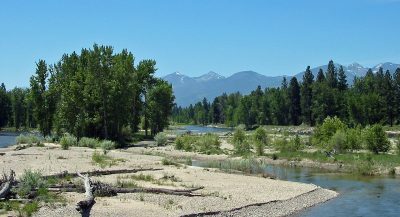 The Bitterroot River itself begins near the town of Connor, at the confluence of the East Fork Bitterroot River and the West Fork Bitterroot River. Each of these two forks offers quality fishing in a beautiful environment, with low fishing pressure as an added bonus. The East Fork Bitterroot River tumbles out of the mountains of the Anaconda-Pintlar Wilderness area. It runs clear throughout most of the year and can become a raging torrent during spring run-off. During low water years, the flows of the river can become very low during late summer. Access to the East Fork Bitterroot River is excellent. From its headwaters down to near the town of Sula, the river flows primarily through National Forest lands and is closely followed by the East Fork Road. Many camping areas also located along the river. Just above the town of Sula, the East Fork Bitterroot River flows through a small, scenic valley that is primarily private property, although a fishing access site does exist. Below Sula, and lasting nearly up to the town of Connor, Highway 93 closely follows the river, allowing for many easy access spots. The East Fork Bitterroot River has good fly fishing for smaller size cutthroat trout. As fishing pressure is generally quite low, the cutthroat trout rise readily to smaller dry flies thrown their way. Since the river is qnarrow in most of its length, casting to all spots of the river is usually easy, although the fast current and large rocks do make wading a challenge. The best fly fishing for cutthroat trout is found early in the summer while the flows are high and again later in the fall when the water has cooled. The West Fork Bitterroot River begins along the Montana/Idaho border. It runs for about ten miles before flowing into Painted Rocks Lake, a man-made lake created by Painted Rocks Dam. Below Painted Rocks Reservoir, it flows for an additional fifteen miles before meeting the East Fork—thus creating the Bitterroot River. For most of its length, the West Fork has decent flows with only a scattering of slow water stretches. The West Fork Bitterroot River above Painted Rocks Reservoir has good numbers of smaller sized rainbow trout, cutthroat trout and brook trout. Access is easy for much of this section, as the river flows through National Forest lands and is closely followed by the West Fork Road. Many camping areas are also located in this stretch. Fishing pressure on this stretch is generally low, and the fish will usually rise to most any small dry flies presented to them. Below Painted Rocks Reservoir, the West Fork Bitterroot River takes on a different character. Fed by the flows from the reservoir, the West Fork maintains decent and cool flows well into the summer. Additionally, this section of the West Fork Bitterroot River runs clear all year long, even during spring run-off. This section of the West Fork Bitterroot River is home to some sizable rainbow and brown trout. Most of the larger fish are caught on large streamers or nymphs, fished around undercut banks and the many log jams in the river. For top water fly fishing, popular flies on this stretch include dry fly attractor patterns, such as the Madame X as well as standard dry flies such as the Elk Hair Caddis. Hoppers and Spruce Moth imitations can also work well beginning in August. 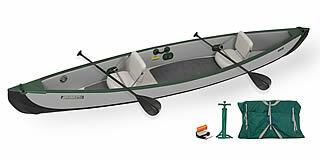 Inflatable canoes are ideal for floating and fishing many waters in Montana and elsewhere and are very portable. The Bitterroot River offers the rafter or floater an enjoyable trip down one of the more scenic rivers in Montana. The Bitterroot Valley is wide and lush, offering the floater excellent views into the Bitterroot and Sapphire mountains. The best floating on the Bitterroot River begins at the confluence of the East and West Forks, near Connor. 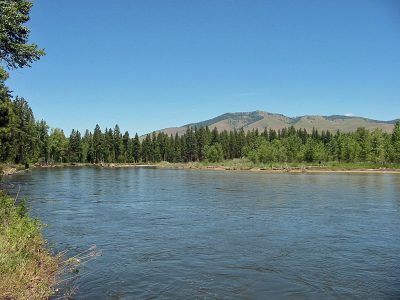 From Connor, the river flows for more than 80 miles to its confluence with the Clark Fork near Missoula. Except for several in-stream obstacles, the river has no whitewater stretches, allowing for anyone to float the river safely, whether it’s by raft, drift boat, inflatable kayak or canoe. The upper stretch of the river has moderate flows. Several diversion dams are found in the upper stretches of the river near Hamilton that can be either easily portaged or floated through during higher water. On warm summer weekends, the Lower Bitterroot receives heavy recreational floating use. The Bitterroot River continues with a moderate flow until it nears Corvallis. In late summer during low-water years, the section of river between Corvallis and Stevensville can become very slow due to irrigation demands. This stretch of the Bitterroot River may not even be floatable during very low water periods. Before floating this stretch of the river in late-summer, be sure to check current river flows and inquire at local guide shops for the latest river conditions. Below Stevensville, the Bitterroot River picks up more flow and floating can resume without any problems. Just below Stevensville, the river flows through the Lee Metcalf Wildlife Sanctuary, providing great opportunities for wildlife viewing. After several miles, the Bitterroot River leaves the wildlife refuge and continues on towards the Clark Fork without interruption, with slightly slower current flows found during the last ten-mile stretch. Listed below are selected river miles for the Bitterroot River in Montana. Visit the Montana FWP website for information about a specific fishing access site (FAS).